Having taken his time to make a breakthrough, Niall Sludden will play a central role for Tyrone on Sunday. 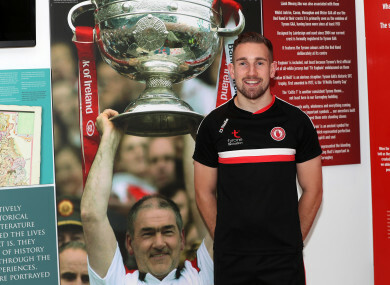 2010 All-Ireland minor winner Niall Sludden will be key for Tyrone on Sunday. YOU HAVE TO hand it to a certain breed of Tyrone footballer. When Mickey Harte comes calling, few refuse the offer. In Tyrone, there is no higher calling than being a county player. And yet when you look through their team and pick out some of their more aggressive performers, the eye is drawn to, say, captain Matthew Donnelly, Kieran McGeary and Niall Sludden. The trio have one thing in common. Harte made an approach to all of them in their teens. And they all made the decision to stick with their clubs and universities, feeling their way into senior football and getting as many games as possible. Take Sludden in particular. In 2010, he was part of an All-Ireland winning minor team. Harte made his play shortly after. “Physically the demands of the game over the last number of years had gone up and I felt I was not doing that,” the Dromore man reflects on his decision. Still, he felt the catch in his throat as he explained his reasoning to Harte. He had to be careful not to leave an inter-county career behind him. “I was young back then and speaking to Mickey Harte, you were very much in awe of the man and of what he had done. Such is his confidence and long-sightedness though, that he remained confident he would come back into the frame. “I was always of the belief that if I kept performing well for the club Mickey would give me the call,” he says. “I suppose in the back of your mind you are thinking that he has forgotten about me because in Tyrone there is so much youth coming through from under-21 teams, you can start thinking that he is looking at those players. Only himself, Ronan O’Neill, Hugh Pat McGeary and Richie Donnelly survive from that minor crop in 2010. “A lot of the team have had opportunities or been around this squad but there has been only a few that have been there,” he explains. His progress was derailed with an awful leg break during a league match against Cookstown on a miserable wet night. Whatever you were doing on your 21st birthday it had to be better than Sludden who spent his on the operating slab of Altnagelvin Hospital. When he came to, the nurses in the ward presented him with a birthday cake. The doubts he held at that stage, he used as fuel and a tool for keeping his perspective. “At that stage you are thinking if you will come back from it. It was definitely a key moment in my life,” he adds. In 2016, he made his debut in the Dr McKenna Cup at 24. He retained his place for the Championship, debuting against Derry. Over the next two seasons he won two Ulster titles and was included on the nominations list for All-Stars. This summer, they failed to collect a third consecutive Ulster title. The vultures surrounded this team and their manager. But here they are; Tyrone, back in an All-Ireland final and united behind their manager. “Of course, the players are all behind Mickey. It is like everything else, sport is very fickle and being an Arsenal fan I know that best,” he says. When they run out against Dublin this Sunday, he will have Eoin Murchan for company, just as he did in Omagh for their Super 8s game. He is at that level now, a player that must be curtailed. “Teams look at certain players they want to stop and defect and they did a very good job that day. Hindsight is a wonderful thing as well and we have another opportunity now to come back,” he reflects. If Tyrone can get their scampering attacker on the ball and lacing those outside of the boot efforts over the bar, they will be on the first step to victory. Email “Turning down squad invite from Mickey Harte, a broken leg on 21st birthday and a Tyrone breakthrough at 24”. Feedback on “Turning down squad invite from Mickey Harte, a broken leg on 21st birthday and a Tyrone breakthrough at 24”.